Arkansas Ozarks zone 7 alluvial,black,deep loam/clay with few rocks, wonderful creek bottom! Maybe the link to his 'gofundme' site could be shared in a 'dailyish' email? It sounds as though he and his family could use our help. does Earth Day mean much anymore? Although I still wonder, five years later, from when I began this thread and also in the time since the first 'earth day', what happened? Aaron Tusmith wrote: Two months now, almost daily I realize in a new way how much better life is as a non smoker. I quit thirty five years ago and am still thankful I was finally able to quit for good with the help of nicotine gum....my pharmacist was so happy I was quitting she let me get the gum on credit if I was short of cash. And I remember in detail the things that improved, like the sense of smell and taste and lung function. it's not an easy addiction to quit...you've done well. When I first saw it, I thought, 'I didn't know moss was edible' ? I keep trying to grow nettle from seed because I can't find the patches of it I know are around here. I have one survivor in a pot. Once when we first moved here I had waded the river and was cutting across a field in the summer time so lots of bare skin...I ended up in a more than head high field of it. No choice but to persevere and there was no doubt what it was by the stinging. Back then I had no idea it was edible...I feel like I missed out on such healthy greens when we could have really used the nutrition. OK, finished the mowing and it's too hot for much else...so here's another new thread to test the algorithm . It's in the hugelkultur forum...looks like one 'similar thread' has hugelkulture in the title but the others listed don't seem related? It seems like to be 'similar' they would at least share the same forum? or certain key words in the title? I do see similar 'linked' words like 'gardening' in the text of the threads. Please keep an eye out on the similar thread lists of new threads. If they show an improvement, we can let the algorithm run on all threads. I don't see 'similarities' in the threads listed as 'similar threads'...not even any in the same forum as 'food choices'. There are other topics about 'raw milk' though when I do a search. The similar threads don't seem similar except maybe the fact that they are mostly 'fixing' things? Three of them mention insulation in the title and all mention 'insulation' in the text, the OP uses the word twice but also uses the word tires or tire five times and there is no similar thread title with 'tire' in the title or in the text of the ones I looked at. Bryan C Aldeghi wrote: Out of curiosity, what are people’s plans on how they are going to share and disseminate the copies of the book they are getting? I'm getting two hard copy books and plan to keep one to share with family and give the other one to our local library. This cake is representative of a Pacific Northwest take on the Japanese tradition of “Hanami,” tree-blossom observing. Instead of reminding us of the frailty of life through ethereal blossoms, moss reminds us of the constancy of life through ancient plants. Mosses have been here far longer than humans have existed, and some of their patches can be hundreds of years old. A stunningly-magical cake that is also really easy, full of nutrition, and tastes wonderful? This nettle moss cake is the best of all worlds. This cake is a vibrant green without the use of any food coloring and is incredibly easy to decorate. Don’t let the stinging nettles intimidate you; they grow plentifully in the springtime and are completely safe (and very nutritious) to consume once the’ve been cooked. A fresh citrus flavor makes this cake extra scrumptious. 1.Preheat your oven to 325F and prepare 2 (9”) cake pans and 1 smaller pan (any shape) by lightly greasing and dusting with flour. Cut out a circle of parchment paper to fit the bottom and grease it as well. 2.In a large bowl, cream the shortening and the sugar. Add the eggs, one at a time, until they are well combined. Add the vanilla, lemon juice, and lemon zest and mix well. Add the nettle puree. 3.In another bowl, sift the flour, baking powder, and salt. Mix well, then mix into the nettle mixture. 4.Pour into baking pans and bake until a toothpick inserted in the center comes out clean, or about 25 minutes. 1.Cream the shortening, salt, and fir needles until smooth and creamy. Add 4 cups powdered sugar and mix at low speed until incorporated to make a stiff dough. 2.Add the grapefruit juice and mix until smooth. Assess the consistency and add more powdered sugar or grapefruit juice as desired. 3.To ice and decorate the cake, first allow it to cool completely. With a long bread knife, trim the tops of the cake so that they are flat. Place one cake onto a serving plate and place strips of waxed paper around the cake for easier clean up later. 4.Spread a layer of frosting over the top of the cake, then carefully set the other cake on top. At this point it can be helpful to place the cake in the fridge for an hour or so for it to firm up. Meanwhile, crumble the scraps from the tops of the cake and the smaller extra cake into coarse crumbs using your hands or a food processor. 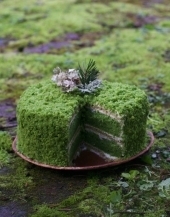 5.Spread the rest of the frosting over the entire cake and press the crumbs into the surface to look like moss. Remove the strips of waxed paper and serve! 1. To make stinging nettle puree, pick off all of the leaves (wear gloves! ), then boil them for a couple of minutes. Strain and immediately plunge into an ice bath to cool. Puree the cooked leaves into a smooth paste in your blender - you may need to add 1 Tbs. of water to get them to grind properly. To make a spinach puree, just blend raw baby spinach leaves in the blender with enough water to get them to form a smooth puree. 2. Make sure to note the lower baking temperature of this cake. Baking it at a lower temperature for longer helps it retain the fresh green color. 3. If you are unable to forage or purchase stinging nettle, spinach works just as well! And don’t worry about your cake tasting like salad - the green veggies add a very subtle flavor that is accented nicely by the bright citrus. You’ll barely notice them. As always, if you enjoy my writing and want to support my mission of sharing everyday magic with strangers, please take a look at my Patreon Page to learn about all of the delightful offerings I have there for you! Notre Dame Cathedral's bees, kept in hives on the historic church's roof, survived the fire earlier this week, the beekeeper says. "I am so relieved. I saw satellite photos that showed the three hives didn’t burn. I thought they had gone with the cathedral," Nicolas Geant told the Associated Press on Friday.